Weather, weed type, water quantity, herbicide selection, and application timing work together to determine your herbicide programs performance. Below, you will find 4 key tips that will help you win the battle with your weeds this growing season. Scout early and often. Spray weeds when they are young. 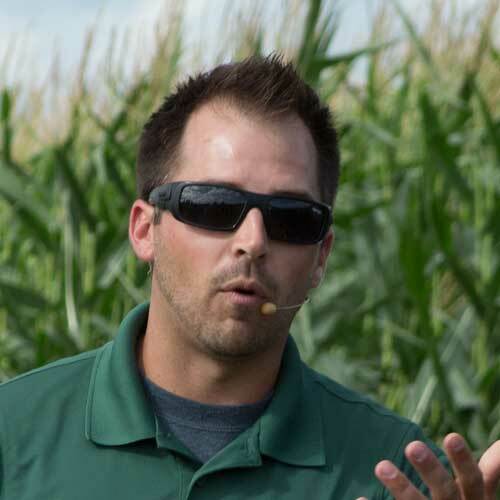 In 2015, early weed scouting showed little to know weed pressure (or at least we thought). There were some weeds along the borders of the fields so we chose to spray the borders and some target areas and then reenter the fields 5-10 days later to spray the remainder of the field. A Minnesota soybean field 42 days after the first herbicide application. The field border was sprayed only once (early) after emergence with glyphosate. Inside the border (where the weeds are present), two applications were made post-emergence with glyphosate—the first application was made later than the border application. Naturally dying plants have plasmolyzed cells. Plasmolyzed cells have water moving out of the cells. Mature plants have turgid cells. Turgid cells hold water within the plant cells. Growing plants have flaccid cells, meaning water flows through the cells. 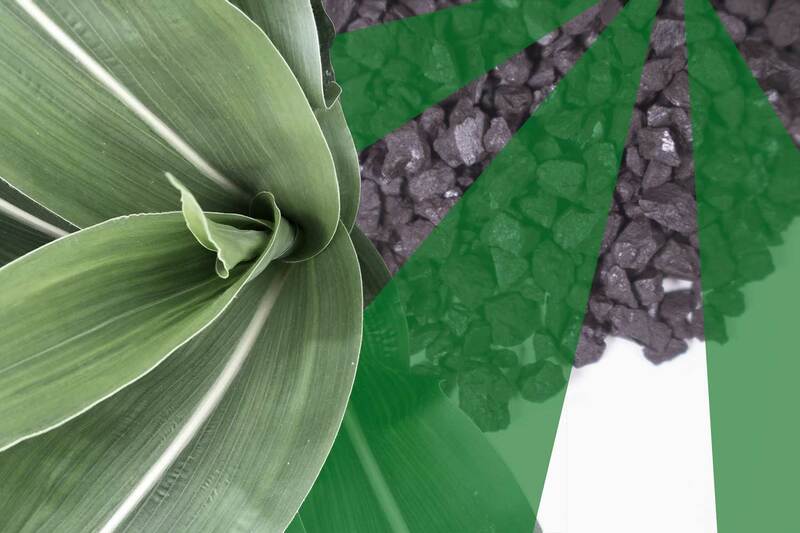 Applying herbicide solutions to growing plants enables faster movement within the plant and improved spray effectiveness. The 3 stages of cells during a plant's lifespan. Use water conditioners and/or adjuvants. pH is the measure of potential hydrogen. The lower the pH of a solution, the more potential hydrogen it has. 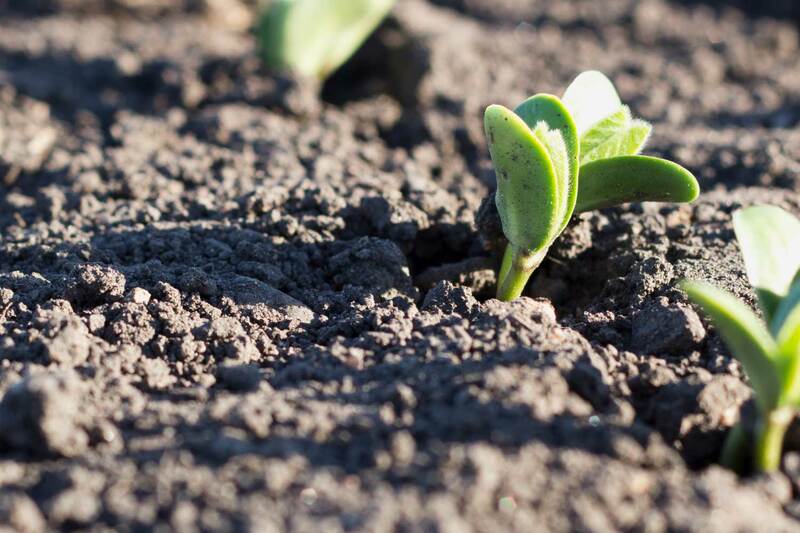 This is relevant to your herbicide program because hydrogen plays a critical role in moving water against nature—into and throughout plant leaves. Hydrogen, and what is molecularly attached to it, moves through the plant with less resistance than salts with the same charge. Thus, a solution with a lower pH (and more hydrogen) has greater molecular mobility and improved spray effectiveness. A trial comparing the effectiveness of AMS vs. Regulator 3.0 as a water conditioner when spraying foliar. Testing the concept of pH and spray effectiveness. AgRevival conducted a trial to analyze the movement of a water solution into a corn plant leaf at the V1 growth stage. Two solutions were prepared containing water, red food coloring, and different water conditioners. The starting pH of the water was 7.79. Solution 1 contained 8.5 lbs. of AMS per 100 gallons of water. The ending pH of Solution 1 was 7.23. Solution 2 contained 16 oz. of Regulator 3.0* per 100 gallons of water. The ending pH of Solution 2 was 5.53. Both solutions were sprayed on corn at the V1 growth stage. After 20 minutes, the performance of each solution was analyzed. 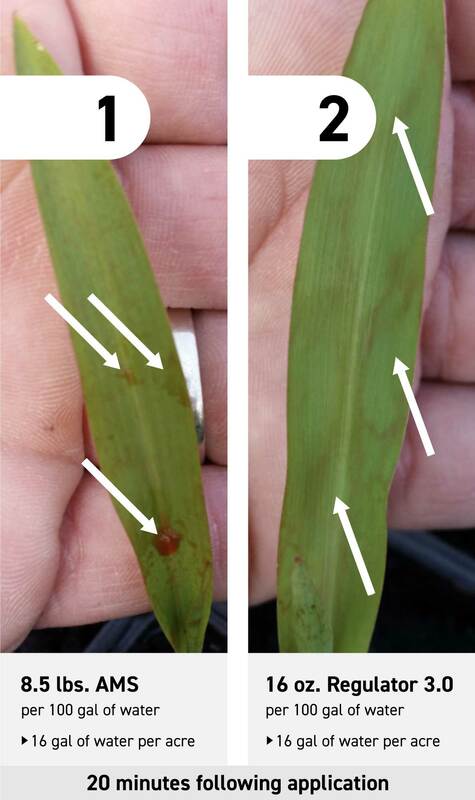 The corn leaf in Picture 1 (sprayed with Solution 1) was still wet to the touch with water droplets still visible on the leaves, meaning the solution had not yet entered the plant. The corn leaf in Picture 2 (sprayed with Solution 2) was dry to the touch and the red food coloring could be seen moving inside the leaf, meaning the solution had entered the plant. The results of the trial supported the concept of hydrogen increasing molecular mobility and spray effectiveness. *Regulator 3.0 is a carbon-based water conditioner that contains no salt. This product is manufactured by CarbonWorks, Inc. and packaged and sold by Max Systems, LLC. Using the right amount of water matters. Just as recommended herbicide usage rates increase with larger weeds, so does the amount of water applied per acre. The larger the weed, the more water you need. Think of 30 droplets of water on a 2-inch ragweed versus 30 droplets on a 20-inch ragweed. To get the same level of coverage, you need more water. Note: Testing showed that higher water volumes are most effective when the pH of the spray solution is near 5.5. Use the right amount of water for the weed size. 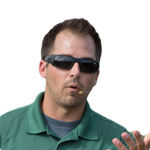 If you want more guidance on the best herbicide programs and practices, reach out to us via our contact page.